Ann Jones was elected to the NFWI board in 2017. Before this she was an ex officio member of the NFWI board as Chair of the Federations of Wales Committee from 2013 and NFWI Vice-Chair from 2016. 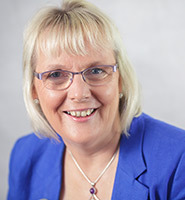 Ann Jones is currently NFWI Vice-Chair and Chair of the Public Affairs Committee. She also sits on the Denman and Finance Committees. Ann and her husband run a Beef and Sheep farm and a property letting business in the foothills of the Cambrian Mountains in Llanddewi Brefi with their two sons. Ann was brought up on a Dairy Farm in Carmarthenshire and was an active member of the Young Farmers' movement. She moved to Ceredigion when she was 25 years old, and immediately joined Llanddewi Brefi WI, where she made lifelong friends and learnt new skills. Ann has played an active role in her WI, joined the committee and never looked back. She later joined Tregaron WI as a dual member. Ann has also been a very active member of the organisation at Federation level. She was Chairman of Ceredigion Federation of Women's Institute from 2010 to 2013. She has also served as Vice-Chairman of the Federation, Chairman of Home Economics and Organisation, and has been a WI Advisor since 2004. She has been an Eco Team Leader (a WI project) and was named on the first Green List awarded by the Welsh Assembly. Ann is a Community Councillor for Llanddewi Brefi and has been chairman twice. She has been a long term secretary of Llanddewi Brefi Show and chairman for two years, and she has also been the secretary of the Horticultural Show. She is a past Vice Chairman of Llanddewi Brefi Primary School Governors. Ann has enjoyed teaching members of the local young farmers' club floral art and is a member of their advisory committee.